Scott graduated from the Arizona State University College of Law in 1999. After passing the bar exam, he immediately became a Prosecutor for the City of Scottsdale, and became the trial head of Courtroom Two, the busiest court in Scottsdale at that time. Scott then became Of Counsel to an East Valley large criminal law firm, where he practiced specifically in the area of Criminal Defense, as well as contracting with the City of Phoenix for legal services in that arena. During that time, he handled hundreds of cases, including dozens of jury trials, as well as major felonies. Scott previously practiced with Chandler 's largest law firm in the areas of Family Law and Criminal Defense. Early in 2007 Scott decided to continue that practice with Wilson-Goodman. 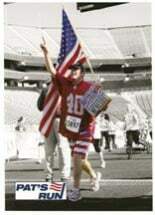 The above picture shows Scott running in Pat's Run, in honor of fallen Army Ranger Pat Tillman, who left a professional football career to serve his country. Although Scott has never served in the military, his father is a Marine (and also an Arizona lawyer,) and his brother is currently serving in the Middle East with the United States Army. Because of the respect we have for our men and women in uniform, including firefighters, police officers, and emergency workers, Wilson-Goodman proudly gives them a 25% discount off of all legal services. It is with deep regret that Wilson-Goodman announce the loss of one of our own, Scott Stewart. Mr. Stewart loyally served with Wilson-Goodman for the past 5+ years as our lead criminal attorney. He had a deep seated passion for support of those in uniform and he took pride in bringing great service and awareness to those in uniform, such as firefighters, police, emergency workers and military personnel. Our most sincere condolences extend out to Mr. Stewart's family, including his children, his wife Monica, his parents, and brother and sister-in-law, and his broad network of friends, relatives, and other people who loved him. He will be sorely missed in our office and our community as a whole. Criminal defense attorney William Trusler handles all of Wilson-Goodman's criminal defense cases.